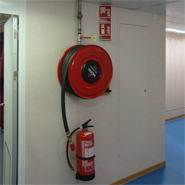 Clearly marked fire extinguishers, fire alarms and rescue equipment are important when an emergency occurs. Clear identification is also important from the point of view of prevention. Because people are able to observe the warnings during normal working and visiting situations, they make mental notes of the locations and the equipment. At the moment that an emergency arises they are capable of acting immediately, even in a stress situation, because they are able to find the extinguishers, alarms and rescue equipment rapidly. There are various ways of making fire prevention equipment, fire-fighting equipment, rescue equipment etc. as easily identifiable as possible. Their presence and location must be visible from all directions at a glance. This applies to both the normal and the stressed situations. Our clients see signage as more than just an obligation resulting merely from legislation and regulations. 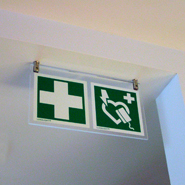 Signage by Blomsma Signs & Safety is always functional and therefore worth the investment. The design of signage and the materials used are important too. Signs should be placed at eye level or higher, as a flat or panoramic sign or as a sign that can be read from three sides. 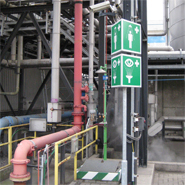 All equipment should be indicated with the proper symbols in accordance with ISO 7010. 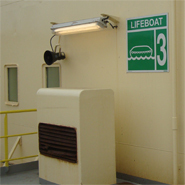 Photoluminescent signs and retro-reflective signs improve the legibility under poor lighting conditions. Additional directional signage must be placed at strategic locations where the primary signs are not clearly visible.